In most tidal rivers the change from ebb to flood is gradual: the ebb current downstream slows, there is a period of slack water, then slowly the flood tide starts flowing upstream. In a few rivers, the behaviour is remarkably different and the onset of the flood tide is marked by a distinct, sometimes very vigorous wave – a bore. Of the one hundred or so rivers around the world known to produce bores, around a fifth of these are in the United Kingdom. This is a consequence of high tidal ranges occurring in several locations around the British Isles – three rivers with notable bores are the Severn, Dee and Mersey. 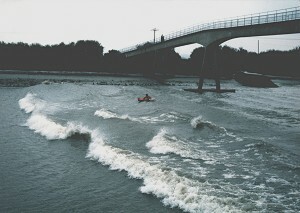 However, the world's largest tidal river bore is on the Qiantang River in south-east China. In the UK the most famous and spectacular is the Severn Bore, and it attracts thousands of tourists. It can be seen as a wave or series of waves, as much as 2 m in height, that sweep up the River Severn, breaking in the shallows at the side of the river, sometimes splashing onlookers. Being the onset of the flood tide, there is a rapid rise in water level, which continues for about one and a half hours after the bore has passed. With the passage of the bore the whole character of the river changes instantly from a calm, tranquil, slowly ebbing stream to a turbulent, fast flowing river with a strong upstream current. 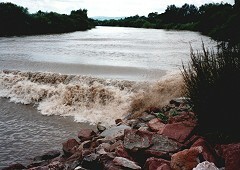 The turbulence following the bore stirs up the sediment so the river can appear to change colour. Often debris torn from the banks by the bore is caught in the after-rush sometimes including whole trees. There are many other interesting effects associated with the passage of the bore. At Maisemore the sound of the river passing over the weir and the sound of the bore rushing upstream are cancelled instantly as the bore simultaneously drowns the weir and is itself halted. The Severn Bore can be seen from its first small beginnings near Sharpness all the way up to the Maisemore Weir above Gloucester. It is at its most developed between Minsterworth and Gloucester although it is certainly worth seeing in its estuary form above Newnham. The bore occurs approximately 250 times per year, ranging from a small ripple to the highest waves. However it is generally at its best when a very high spring tide is predicted, something in excess of 14 m at Avonmouth. Hence there are probably just a few occasions in the year at spring tides in the months around the equinoxes in spring and autumn when the bores are at their most spectacular. However, a good bore can't be guaranteed as it is affected by other factors. For example, if there is a lot of extra water in the river due to heavy rainfall the bore is diminished. This, together with other influences such as wind, may also alter the timing of the bore by about a quarter of an hour. The following are approximate times to expect the bore at various locations relative to High Water Avonmouth (HWA) – tidal predictions for Avonmouth can be obtained here. Two north-west rivers that produce bores are the Dee and the Mersey. They are at their best when very high tides are expected above 10 m at Liverpool, which occurs on only a few days each year. However lower tides can produce good bores if other factors are favourable such as a period of dry weather reducing fresh water flow in the rivers. The Dee Bore may be seen at the old road bridge at Queensferry about two hours before High Water Liverpool (HWL). It arrives at the Saltney Ferry footbridge about one and a half hours before HWL and then takes a further half-hour to arrive, somewhat reduced, at Chester. 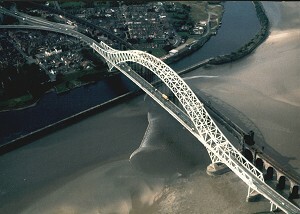 The Mersey Bore may be seen in the lower estuary opposite Hale Point about 2 hr 25 min before HWL. From the park at Widnes West Bank it may be seen passing under the Runcorn road and railway bridges about 1 hr 50 min before HWL. Under good conditions the bore may be seen as far upstream as Warrington passing under the railway bridge south of Bank Quay station about 20 min before HWL. It passes rapidly through the town centre and arrives at Howley Weir just before HWL. Tidal predictions for Liverpool can be obtained here. If you can go a number of times you will have a better chance of seeing something quite awe inspiring. 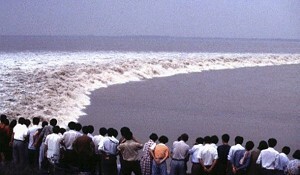 The Qiantang river at Hangzhou in China has the largest tidal river bore in the world, which can be over 4 m high, 3 km wide, and travelling with a speed in excess of 24 km hr−1 (15 mph). At certain locations, reflected waves can reach 10 m in height, and its roar can be heard over an hour before its arrival. When a large bore is forecast, many spectators line the banks to watch its progress. Great care is required – several tragic accidents have occurred when reflected waves suddenly increase the bore height and break over the banks, washing away unwary people.